Audio post production is laborious and time-consuming. To the uninspired it is also tedious. No matter what, it is necessary. This quick guide covers a lot of ground. It tries to explain in lay man’s terms, the process of audio post production, the workflows involved, and their importance in the overall scheme of things. Don’t worry if it doesn’t make sense. All will be explained. The orange bars represent things you have, and the blue bars represent things you do. Ambient sounds, room tone, etc. If you’ve used a sound recorder as outlined in the Chapter on Audio in the Comprehensive Rigging Guide, these recordings will be stand-alone, in either AIF or WAV format. This is why they are represented as squiggly lines in the chart. Each recording is separate, taken on separate times in different locations, and maybe with different equipment. You need to get them in order, shepherd them, if you will, where they belong. Where do they belong? Every recording is ultimately paired with imagery, unless they are to be discarded. For this reason it is prudent to find ways to ensure your audio and video can sync with each other, even if you record them separately. Syncing means aligning. The lips must be in sync with the voice, and so on. The traditional way to ensure syncing is by using a slate or clapboard. The modern way is by using Time Code, and/or an electronic slate as well. On low-budget productions, you usually record audio in sync with camera – sometimes with frustrating results. When this happens, you try to use software that helps to sync audio and video together. Syncing sounds tedious, and it is. That’s why it is so important to get your workflow right on set. This process is also called conforming, where you try to match audio and visuals. Conforming can also include dealing with codecs, changing duration, etc. In the olden days you just aligned them. Today, you have a lot more options (problems) in your hands. If you have done your production audio right, you can use an autoconform tool (software) that tries to match everything automatically. Half the time it’s perfect, the rest of the time it might need a bit of prodding. Syncing Dailies (a term from the film days), is an activity that you do (which is why it is in blue); to bring all the unruly recordings under their respective visuals. Without this step the editing process cannot begin. I’ve already explained what editing is here. Due to the nature of editing, and the nature of human beings in general, it is almost impossible to know when exactly an edit will be ‘locked’, i.e., finished for good. Sometimes it is locked many times, sometimes only once. Usually it’s in between these two extremes. Therefore, on complicated projects like feature films, etc., sound editing also involves the Editor and the Assistant Editor. Nobody wants to go back to redo things, so it is better to let them sit together and share the pain. It might not seem like the right way, but creativity is rarely linear, so a circular workflow is a necessary evil. Each row is a track. The system is similar for NLEs and DAWs. It is the job of the editors, both video and sound, to organize the recordings into readily available tracks. On a feature film, these tracks can run into the hundreds, so you can appreciate the importance of proper organization. All tracks are correctly named so that the sound editing team can understand the editor’s and filmmaker’s intentions. Once the edit is locked, the ‘finished’ audio timeline becomes a guide track. 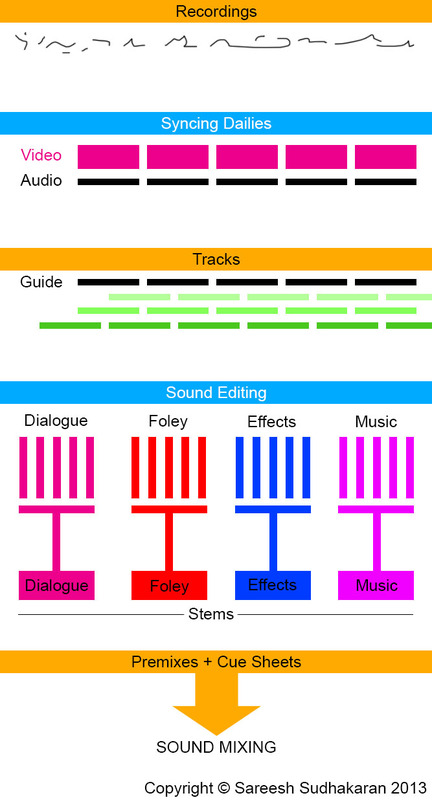 The guide track preserves the filmmakers’ intentions, and it forms the basis for the sound editor to do his or her magic. It is also important in the sense that you don’t miss anything. It is easy to miss a small effect or audio sample in the large expanse that is the DAW’s timeline. 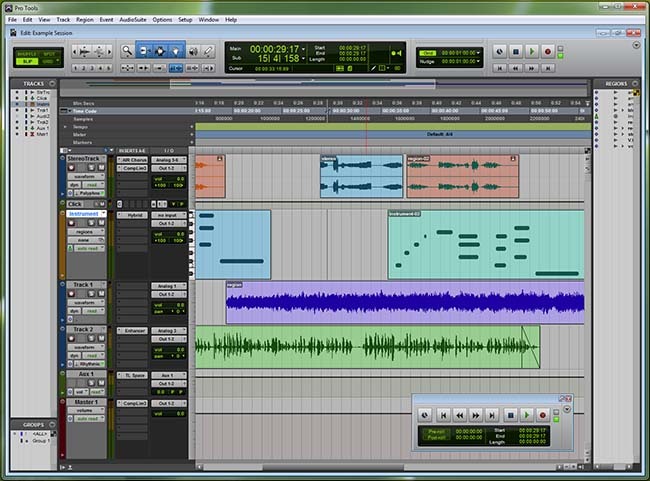 The sound editor assembles and organizes the audio recordings and tracks, not in the way the editor did it, but in the way that is most beneficial for the rest of the audio workflow. Chosen – find the best possible recordings for the final mix. Cleaned – for noise, artifacts, reverb, etc. Filtered – various effects added to enhance or manipulate the recording to deliver a specific feel. Layered on the timeline, in sync with the visuals. This is the stage where the sound editor also decides if any audio needs to be re-recorded. This is the stage where every sound is decided on, assembled and made ready for the final mix. My explanation is slightly simplistic. The job is a major one. Some projects have multiple dialogue tracks (one in each language for foreign release), multiple song and music tracks (same reason), etc. All in all, you’re looking at hundreds of tracks, with no room for error. It is for this reason that there’s a separate Oscar category for Sound Editors – the job is as creatively and technically demanding as that of editors. Once all the different ‘groups’ of audio are ready to be passed on to the mixers, they are premixed. Dialogue is premixed, foley is premixed, music is premixed and other effects are premixed. The premix preserves the intentions of the filmmakers, and also creates what are known as Stems. You have a dialogue stem, foley stem, music stem and effects stem. You might also have several dialogue stems (one for each language) and so on. Why premix? The guiding principle behind this is to ensure the sounds have been correctly positioned and treated, and are ready for the final mix. It also allows for an additional layer of ‘grouping’ (organizing data). We started with recordings, then synced them with video, then assembled them into tracks, then chose the best ones and edited them, and finally we group them into different branches or categories so they can be found easily. The premixes, which might include the tracks unmixed as well (in case someone feels like changing anything), is sent to the sound mixers, along with the Cue Sheet. The cue sheet is just a document that explains, in timeline form, where each sound is located (written in time notation) and what effect or manipulation has been applied to it. This document preserves the intentions of the filmmakers, the editor, and the sound editor. As you can see, we’re playing a complicated version of Chinese whispers here. Preserving the artistic intention while maintaining the most efficient workflow is the order of the day. In Part Two we’ll look at the second half of audio post production – sound mixing.